Our JL Duffel Is Now Available In Red Buffalo Wool Fabric. Chic & Stylish! Our JL Duffel Is Now Available In Camouflage. Chic & Stylish! Our Best Selling Quilted Luxe Duffel Is Now Available In NEW Mini Size. So Cute! Our Best Selling Quilted Luxe Duffel Is Now Available In Stunning Pearlized Ivory Quilted With Shiny Brown Patent Trim! Our Best Selling Quilted Luxe Duffel Is Now Available In Graphic Black & White! Our Best Selling JL Duffel Bag Is Now Available In Our Signature Noir Dots Fabric With Shiny Brown Patent Trim! 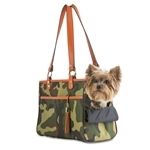 The Quilted Luxe JL Duffel Tote is a new addition to our collection of designer dog bags. Made of soft quilted faux leather and shiny black trim.